As we keep saying, the StickerYou Sticker Crew is always on the lookout for cool custom sticker designs and ideas. We frequently contact customers and clients who have printed stickers with us to ask if we can share their art on our social media pages and inspire others with their designs. However, sometimes we come across a sticker idea or design that requires more of an explanation than the 600 character limit of Facebook or 42 character limit of Twitter. This time, we would like to share with you some designs made by Emily Bringmann, designer and owner of Feathered Heart Prints Stationary and Designs. With wedding season soon approaching, we thought it very appropriate to share these beautiful labels Emily created for one of her clients. They are labels for 12 wine bottles. 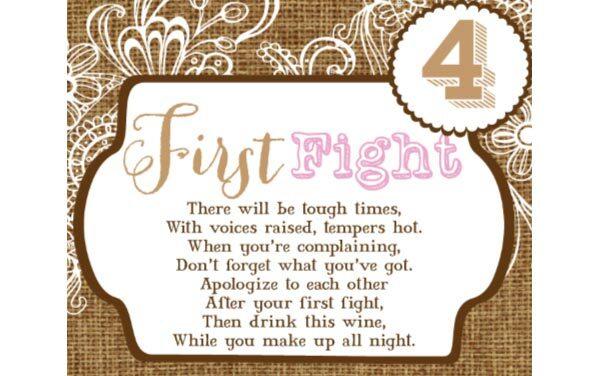 Each label has a different “First” on it and the intention is that the newlywed couple will share each bottle of wine after each “first”. The labels include “Honeymoon”, “First Valentine’s Day”, “First Fight”, “First Baby” etc. A case of wine with such beautiful custom labels would make a great wedding gift and be a sweet way for the couple to share milestones of their first year or first few years together. In this case, Emily’s labels have numbers on them as well, and her client is using the bottles as unique table markers at her upcoming wedding. Emily says she makes and sells invitations on her Etsy shop for a variety of occasions; she then found StickerYou online and began making wine labels as fun and unique gifts. She tested them out at a friend’s bridal shower with just 6 “firsts” and they were a hit, so she has begun including them in her Etsy shop as well. Thank you Emily for sharing your custom printed labels with us. We think the idea is fantastic and hope Emily’s labels continue to be such a hit. Other versions of the same concept include Congratulations on your Baby theme, including such firsts as “First Steps”, “First Boo-boo”, “First Time Away from Mom and Dad”, etc. All moments when you may want to sit and enjoy a glass and toast to parenthood. As always you can make your own custom wine labels on StickerYou’s website. Make sure you take a moment to check out Feathered Heart Prints Facebook for discounts and promotions.